Moku Pua products are made from nature, with pure natural ingredients formulated without harsh chemicals. The results will keep you feeling and looking great at any age. Whatever you do or choose for your skin and body, keep it as close to natural as possible. Plumeria is the traditional Lei flower of Hawaii, sometimes known as the “Hawaiian Frangipani.” It is a very fresh, clean, and beautiful floral scent that is sweet and slightly fruity. A very exotic, tropical fragrance, it brings memories of gentle Hawaiian breezes of a heavenly scent. The clean, fresh tropical scent of Plumeria is infused with Jasmine to create this exotic, sweet, warm floral bouquet. 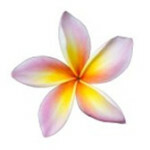 Plumeria Jasmine is a Hawaiian delight that is a crisp, energizing romantic fragrance. Pikake Jasmine is a wonderful floral fragrance with the sweet, exotic notes of Plumeria and the Pikake, known as the Hawaiian Jasmine flower. This fresh white tropical flower is highly valued in the islands as one of the most treasured lei flowers. Pikake Jasmine is a wonderful, soothing, tropical experience. Come to the islands with the scent of warm coconut with caramel notes, paradise, and vanilla. Fresh, warm, sun-toasted coconut and vanilla will entice your senses and transport you to another world entirely…the world of relaxation, wonder, and romance. Toasted Coconut is reminiscent of sunshine and suntans, and warm bodies on the beach. Pure and clean with no fragrance added. This enticing tropical fragrance opens with the scent of fresh, juicy sliced pineapple, mixed with creamy, sweet coconut to create a tropical sensation. This is a great tropical scent and very refreshing. One sniff and memories of lying on a warm sandy beach with a Pina-Colada in your hand come to mind. All you need is a tiny umbrella! Papaya Lilikoi is a refreshing blend of ripe, juicy papayas infused with tangy passionfruit (lilikoi). This is an invigorating tropical scent that soothes and awakens the senses. The Papaya Lilikoi products of Sugar Scrub and Handcrafted Soap have the added benefit of dried and ground Organic Papaya Seeds, which add extra exfoliating properties. Moku Pua’s Tuberose is a complex sweet and elegantly floral blend of Tuberose, Lily, and Rose with a touch of Musk. Currently available only in Perfume Oil. Moku Pua’s Guavaberry is a magical blend of ripe, sweet island Guava mixed with Tropical Hibiscus with a hint of Mandarin. It’s a fresh, tart, and fruity blend that reminds one of a juicy Passion Fruit. Currently available only in Perfume Oil. Moku Pua’s Hawaiian Sandalwood is an alluring, classic scent of Sandalwood. It is an earthy blend that is clean, woodsy, musky, and sensual. Soft, warm, and masculine. Currently available only in Perfume Oil.